I hope you are all having a safe and restful summer! 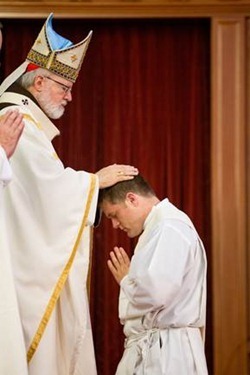 As regular readers will remember, each year around this time I like to invite one or two of our newly ordained priests to share their experiences with you. I think it is an excellent opportunity for people to get to know them better. Also, I think it is very valuable for other men considering a vocation to hear these stories — to realize the great joy that can be found in answering the Lord’s call. This week, I have asked Father Eric Cadin to share his reflections with you. 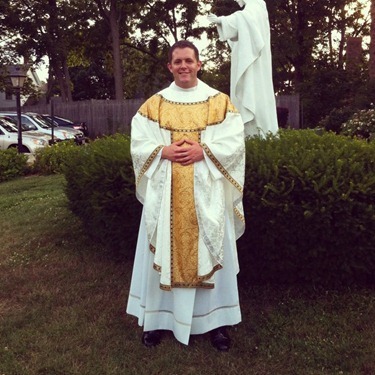 Father Cadin is originally from St. Francis Xavier Parish in South Weymouth and studied at Harvard before entering St. John’s Seminary. 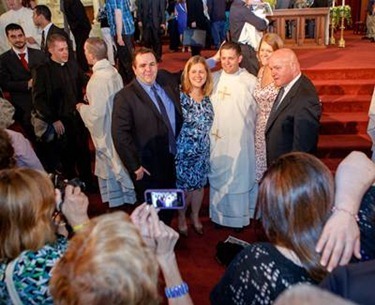 He is just settling in to his new assignment at St. Michael Parish in North Andover. It’s become a cliché. Whenever anyone wins an award or receives an accolade—movie star, musician, politician, student body president—he or she inevitably thanks, at the beginning or at the end, God. The cardinal has asked me to share my experiences of vocation and priesthood. I must therefore begin by thanking and giving all praise to God. “Before I formed you in the womb I knew you, before you were born I dedicated you, a prophet to the nations I appointed you” (Jer 1:5). It’s true. God does everything. He makes us the saints he calls us to be. I am still learning…and have a long way to go. But as I look back, in faith, at my life, I see God at every step and in every moment. Today marks the twenty-day anniversary of my priesthood. 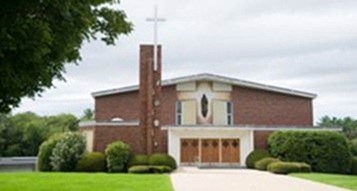 The people of St. Michael’s Parish in North Andover (my priestly assignment) have welcomed me with extraordinary kindness, generosity and enthusiasm. 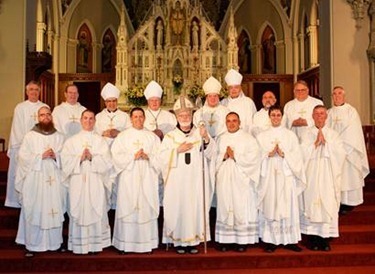 Were I to write only on my priestly experiences I fear I might run short of adjectives extolling the wonderful people I have met here in North Andover. Instead, I want to look at two times in my life when I awoke to God, to his calling in my life, and to the grace necessary to seek after holiness. A boy growing up in St. Francis Xavier Parish in South Weymouth, I didn’t know anything other than the Catholic Church. At the risk of sounding overly nostalgic, I can remember the Church being an important and all-encompassing influence in my young life. Everyone I knew was Catholic. Nuns taught me in class (thank you Sr. Jean, Sr. Ann Regina, Sr. Teresa). 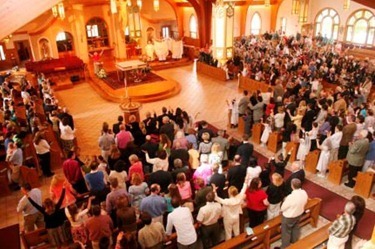 Holy Days meant Mass. I was proud to be Catholic. 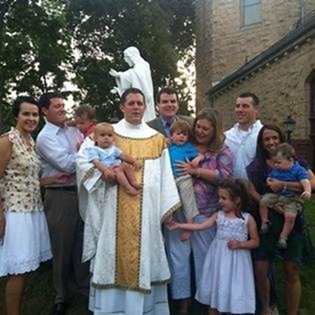 Every Sunday my dad would corral us four kids (my older sister, me, my younger sister and younger brother) into the car and off to Mass we’d go (disclaimer: my mother worked the night shift as a nurse and so would go either early in the morning on her way home or the night before). Our pastor, Fr. John Mulvehill (now pastor of St. Anthony’s in Cohasset), knew my name, would greet my family after Mass, and loved to regale us kids with wonderful stories, lessons, and homilies. I have two distinct memories of being a second grade boy at St. Francis Xavier School. I wanted to be a priest (I remember thinking, what a cool job, I bet every boy here wants to do this). I absolutely loved the Blessed Mother. I can still hear the songs sung at her May crowning. Our Lady captivated me. Her statues were beautiful. In the way that only a seven-year-old boy can…I loved Mary. Years, and dare I say wisdom, give new eyes to life. I believe — in fact I am certain — that those years were the most important in terms of my vocation, my faith, and even my salvation. You see, it was very soon after, that the allure of world, that is, temptations to selfishness, entitlement, and pleasure, slowly and persistently captured me. Thoughts of the priesthood faded far away. While for my part I was drifting away from God, He and His Mother doggedly pursued me…and protected me. Those prayers, devotions, and pious actions of that seven-year-old boy were not just some ritual. At times I may have been aware, but in a way more real than I could know, I was brought into a relationship with my God, and His mother, that my unfaithfulness could never sever. “If we are unfaithful he remains faithful, for he cannot deny himself” (2 Tim 2:13). Why did I back down, defer, or pass on certain sins when I put myself in situations where even those around me succumbed? Why, as I look back with the eyes of faith, do I see Our Lady’s protection over me in spite of my apathy? The long answer involves divine providence; the short answer: love. The love of my childhood slowly shone its way through the shadows during my time at Harvard College. While I didn’t think or speak in such a way at the time (or even know what could be meant by “God’s friends”); God sent His best friends to me. Strong Christians, and Catholics, taught me, even showed me, who I am: a beloved son of the Father. Harvard can be a challenging place, in more than just academics. Surrounded by such extraordinary individuals, some, if not all, can strive and struggle to find and to claim an identity. For the longest time I looked to the world and to the culture for my cues and sense of value. I had become convinced that value, especially my value, flowed from what I offered, that is, what I could achieve. One way that this manifested itself was in athletics. While I succeeded in academics, I convinced myself that I was only as good as my athletic achievement. Unfortunately, though there were times when I was good, I was never great. 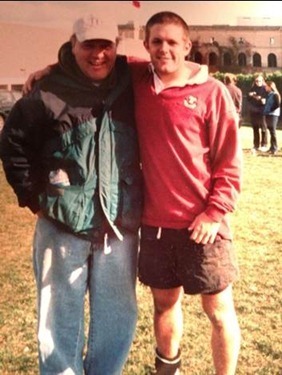 At Harvard, during my freshman year, I joined the rugby team. Though a team with more than a century of history, we were in a bit of a lull in terms of success. A great core of young guys joined the team with me, and over the course of the next four years through fall, winter, spring, and summer practices we got good, real good. 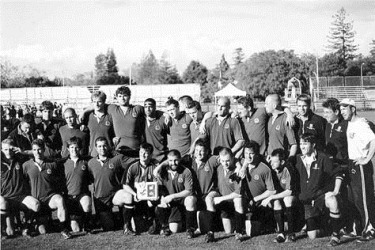 By the middle of my sophomore year I was playing more regularly on the First XV—the starting squad. Suddenly, I was successful again, and a natural esteem followed. Yet all the while I felt precariously perched; an injury, a better player, my own limitations…any of these would relegate me, again, to a supportive rather than starting role. 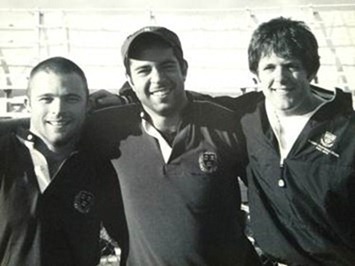 Contemporaneous with my development on the rugby team, my faith and my relationship with God began to flourish. After all, God surrounded me with His best friends. They introduced me to our Lord, immersed me in the scriptures, and pushed me deeper into my Catholic faith. They witnessed to me the freedom and joy of living as a Christian—more importantly, as living as a beloved son of the Father. They didn’t care what I offered or could do…they loved me for who I am. My contingent identity crumbled and I saw and knew myself as my Father saw and knew me. That changed everything. By my senior year my fears came true. In preseason I got injured. During my recovery I lost my position to a younger, faster, and more athletic teammate. As the season progressed and I returned, we would share the position. We did really well that year. For the first time in two decades we advanced to the Sweet Sixteen national tournament…then the Elite Eight…then the Final Four…then the National Championship. All our practices, conditioning and sacrifices had paid off. The game was played out at Stanford. It was nationally televised. Hundreds of Harvard alums came to cheer us on. I didn’t play. A rugby game, an injury, a starting position: none of these are momentous or critical situations in life, I recognize. I reflect upon it today, not so much for the content, but to pause and to recognize, in gratitude, the powerfully personal, specific, and, as it seems in the moment, significant ways that God reaches into my life to show me Himself. I am not special. I certainly didn’t do much to call upon God. Many times I seemed to be actively rejecting Him. He sought me out; He pursued me; He captured me: “We love because he first loved us” (1 Jn 4:19). God called me to the priesthood. He prepared me, His mother protected me, and He loved me. I pray that I might be, by His help, in His grace, and with His virtue, the good and holy priest He made me to be. I pray too that all of us, His friends, might know how loved we are and who we are. That we be filled with courage to respond generously to the life and to the vocation that God calls each of us, personally, individually and intimately. 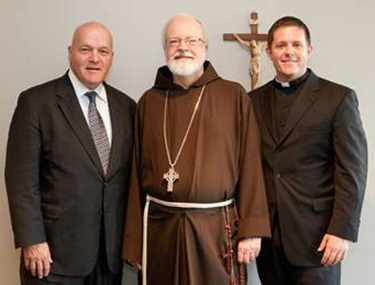 © 2019 Archdiocese of Boston, All Rights Reserved.